When you’re looking for butcher blocks that were made in America, you don’t have a whole lot of options. Naturally, though, the choices you have are of excellent quality. 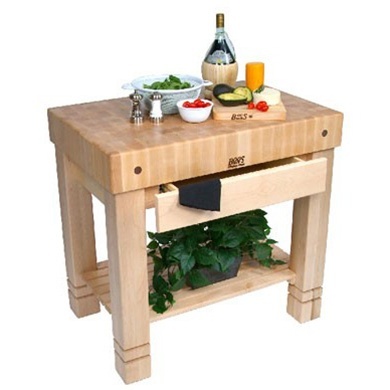 John Boos , based in Illinois, has been making butcher blocks and gourmet tables here in America since the 1800’s. 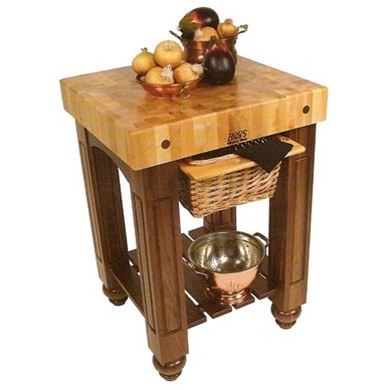 The craftsmanship is unparalleled and the tables are made from solid North American hardwood. They’ve been through the ups and downs of over a century of business, and their product is strong for it. Not only are these stylish and built to last, but they will become sought after in the coming year as American Made goods seriously come back into style. This is a good time to get ahead of the curve. When you’re outfitting your home with beautiful furnishings and functional kitchenware, you’ll want to go with American Made products. There are more advantages than just another opportunity to Spend on America. The food industry in America has very strict standards for the preparation of food. Public safety is of the highest priority. John Boos butcher blocks are built under the highest standards, exceeding all requirements for commercial grade kitchens. This is a standard you will not find the foreign competitors racing to meet as they try to turn out a cheap profit. 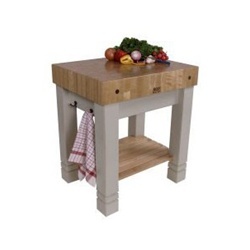 If you take a look at the John Boos line and you see something that can fit with your kitchen, great. It will be a great chance to help support American products. You can either find a local store that carries the John Boos American made butcher blocks, or you can support Spend on America by purchasing them online and having them delivered directly. Either way, when you buy a butcher table that’s made in America you are doing a small part to help your country.